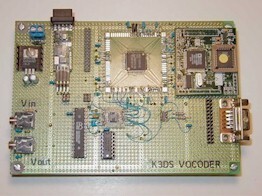 An Advanced Multiband Excitation vocoder based on the DVSI AMBE-2020 vocoder is being designed for low-bit rate voice communication. The alpha prototype is shown with the AMBE-2020 device at the top center. An Analog device ADSP-2185 digital signal processing microcomputer, at the top right, is configured as an orthogonal frequency division multiplexing (OFDM) modem. The host microprocessor is a Ubicom SX28A. The latest configuration is the AMBE vocoder core but with a USB 2.0 interface to a PC, a Windows XP/Vista control program and a Xilinx Spartan-3A FPGA replacing the ADSP-2185 and the Ubicom SX28A.